Vidcon has finally arrived! I've been waiting months for this moment. I have been purposefully building my blog and YouTube channel over the past year, and I am so excited to finally take part in this amazing opportunity. 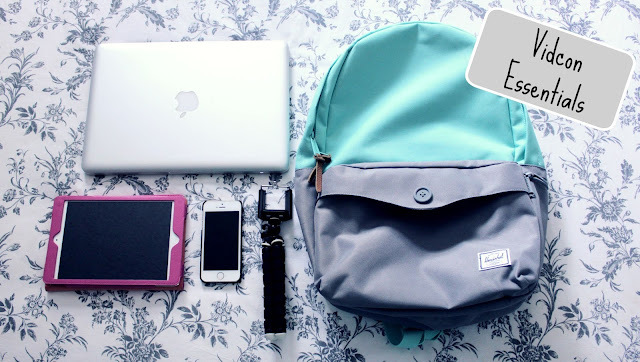 For those of you who have never attended Vidcon here are a few essentials to include in your packing. You'll be well prepared for every vlogging opportunity. 1. Backpack: This Hershel backpack is my new favorite accessory. It organizes all my tech gear perfectly, and it has extra room for merch. 2. Laptop: A laptop is necessary if you plan on doing any editing. I use my phone and iPad for editing as well, but it's a lot more efficient to use my laptop. 3. iPad/Kindle: It's important to give yourself downtime during the busy Vidcon schedule. Plus, you'll want to be reading your favorite Youtuber's books while you are there. 4. Mini Tripod: This mini tripod is great for traveling. It's perfect for desktop filming with your phone. 5. Camera/iPhone: Obviously, you'll want to capture all of the amazing moments on camera.